Even though the crisis deepens in Europe as the ‘bailout’ of Spain fails to stop the negative reaction of financial markets and Italy shows every sign of slipping into a depression along with the rest of southern Europe, I must return to my current hobby horse, the Keynesian theory of capitalist crisis and the policies to resolve it. Usually I am obsessed with supporting Marx’s rate of profit theory as an explanation for capitalist crisis. But once again, recent comments by the great Keynesian guru, Paul Krugman in his blog (http://krugman.blogs.nytimes.com/) stimulates me into returning to Keynes (see recent previous posts on various aspects of Keynesianism, Paul Krugman, Steve Keen and mysticism of Keynesian economics, 21 April 2012 and Liquidity traps, effective demand and debt deflation, 27 April 2012). 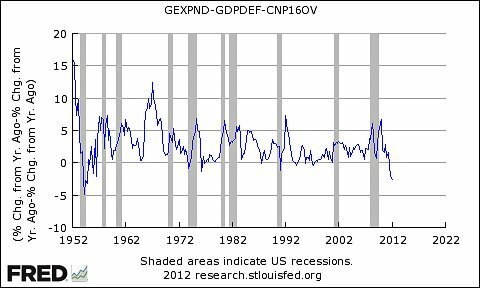 In a recent post (1937, 3 June 2012), Krugman brought up the question of the renewed capitalist slump of 1937-8 during the Great Depression of the 1930s. In the post, Krugman suggested that current government policies in Europe and the US reminded him of the mistake of President Roosevelt in 1937 when he adopted fiscal austerity and pulled back on government spending programmes he had adopted after 1932, which, according to Krugman, pulled America out of the Great Depression (see graph below). According to Krugman, the subsequent austerity caused the slump of 1937-8. Just as then, the answer now should have been more government spending through borrowing and not fiscal austerity. This is the dominant refrain of the Keynesian alternative to official economic policy in the US and Europe. And it’s not just Krugman. There is a new radical think-tank that has just kicked off in the UK. It’s got a great name: Class: the Centre for Labour and Social Studies. Sounds socialist, even Marxist, yes? Unfortunately, at its first meeting, the speakers, especially the economists, were all Keynesian to a man and woman. Take the main paper at the conference: Fiscal austerity: the cure which makes the patient worse, by Professor Malcolm Sawyer http://classonline.org.uk/pubs/item/fiscal-austerity-the-cure-which-makes-the-patient-worse-full-paper. All the Keynesian arguments are presented against austerity. Apparently, a Marxist analysis and the role of profit has no contribution to make in explaining the Great Recession and the ensuing long depression and, above all, what to do about it. And only last month, John Weeks, a longstanding Marxist economist at SOAS and author of several seminal books on Marxist economic theory, put a piece out praising the ‘Argentine’ alternative to neoliberal policies (http://www.compassonline.org.uk/news/item.asp?n=15307). Apparently, the current ‘social democratic’ President Kirchner has instituted a central bank run under ‘democratic control’. I’m sure central banks should not be ‘independent’. When their independence was established during the neoliberal period by other social democrats like the UK’s Gordon Brown, it meant independence from government so as to operate in the interests of the banks and finance capital. But is a politically-controlled central bank that can offer lower interest rates and perhaps easier money for businesses really the only policy in this global depression? It’s pure Keynesianism to imply it – or am I being unfair on Professor Weeks? Well, I’m going further. I think it is a serious deficiency for those fighting for labour against capital and needing to find the right policies to rely on Keynesian theory and policy. Why do I say that? Well, let me start with the kernel of Keynes’ contribution to economics: his emphasis on the macro economy, the original focus of the classical economists of early industrial capitalism (Smith, Ricardo, Malthus), rather than the micro economics of the behaviour of individual economic ‘agents’ (firms and consumers) beloved of the neo-classical school that dominates now. Keynes wanted us to focus on the macro economy through his key national accounting ‘identities’. National income = national expenditure – that’s easy. National income can then be broken down to Profit + Wages; and National expenditure can be broken down to Investment + Consumption. So Profit + Wages = Investment + Consumption. Now if we assume that wages are all spent on consumption and not saved, then Profits =Investment. So far, so good. But here is the rub. This identity does not tell us the causal direction that can help us develop a theory. For Keynes, the causal direction is simply that investment creates profit. But what causes investment? Well, the subjective decisions of individual entrepreneurs. What influences their decisions? Well, ‘animal spirits’, or varying expectations of a return on investment etc. Already we are back into the subjective approach of the neoclassical school. Anyway, the idea that profits depend on investment is back to front. For Marxists, it is the other way round: investment depends on profit. And profit depends on the exploitation of labour power and its appropriation by capital. Thus we have an objective causal analysis based on a specific form of class society, not based on some mystical psychoanalysis of individual human behaviour. The Keynesian causal direction leads to a cockeyed understanding of the laws of motion of capitalism. This brings me to the profit equation developed by Michel Kalecki, a Polish economist and synthesiser of Marx and Keynes. His equation is simply that Profits = Investment; or more importantly, profits depend on investment. As a recent paper (James Montier, What goes up must come down!, March 2012) supporting Kalecki put it succintly: “This is, of course, an identity – a truism by construction. However it can be interpreted with some causality imposed. After all, profits are a residual: they are reminder after the factors of production have been paid.” Really? That’s neoclassical theory. Montier goes on: “Investment drives profits because when a firm or a household decides to invest in some real asset they are effectively buying a good from another firm, creating profits for that entity.” So it seems that profits come from buying things (consumption) and not from surplus value created in the labour process, as Marx argued. This argument is spelt out even more explicitly in a 2008 paper, Where profits come from, by David Levy, Martin Farnham and Samira Ryan at the Jerome Levy Forecasting Center. The authors state that the profits equation identifies the “sources of profits = investment, non-business saving (households), dividends and profit taxes.” How taxes on profits can be a ‘source’ of profit is beyond me. Or how dividends can be a ‘source’ of profit rather than a part of profit is also weird. Take these out and assume workers don’t save and we are back to the ‘source’ of profit as investment. But following the Kalecki equation further: Profits = Investment – (non-capitalist) Savings. Savings can be divided into three parts: savings by households, saving by governments and foreign capitalist savings. If households save more (as they tend to do in a slump) and foreign savings rises (in other words the national economy’s deficit with the rest of the world rises), then investment will be lower and so will profits. However, there is a saviour: government savings, or to be more exact; government dissaving. If government runs up a big budget deficit, in other words, dissaves, it can boost investment and thus profits. Indeed, currently, in the US, using the Kalecki profits equation, it would appear that profits depend on government dissaving or net borrowing. Without it, profits would fall. So the last thing that capitalism should do is cut government spending. The Keynes-Kalecki profits equations tells us that capitalism can be saved by more government spending, not less. And yet official policy is the opposite (see graph below of US government spending excluding social transfers). So, just as in 1937, the official policies of austerity are going to create a new slump. But what if we turn the causal direction the other way: the Marxist way. Now investment in an economy depends on profits. If profits are fixed in the equation and cannot be increased, then investment cannot be increased. So capitalist investment (i.e investment for a profit) will now depend on reducing the siphoning off of profits into capitalist consumption and/or on restricting non-capitalist investment, namely government investment. So capitalism needs more government saving, not more dissaving. Indeed, it is the opposite of the Keynesian policy conclusion. Government borrowing will not boost profits, but the opposite – and profits are what matters under capitalism. So government is a negative for capitalist investment. Government spending will not boost the capitalist economy because it eats into profitability by depriving the capitalist sector of some of its potential profit. Kalecki sort of realised this in his famous paper, Political aspects of full employment, 1943, when he said: “public investment should be confined to objects that don’t compete with the equipment of private business. Otherwise, the profitability of private investment might be impaired and the effect of public investment upon employment offset by the negative effect of the decline in private investment”. In an, as yet, unpublished paper (due to be presented at this year’s UK Marxism Conference), Guglielmo Carchedi presents the difference I have described here as between the Keynesian multiplier (i.e. consumption to investment to profits) and the Marxist multiplier (i.e. profits to investment to consumption): “In the Keynesian multiplier, state induced investments have a positive effect on production and thus on income, spending, and saving…..Profitability plays a subordinate role and the effects on the economy are always apparently positive. In the Marxist multiplier, profitability is central…. The question is whether n rounds of subsequent investments generate a rate of profit higher than, lower than, or equal to the original average rate of profit”. The Marxist economists Gerard Dumenil and Dominique Levy have made desperate attempts to reconcile the Keynesian/Kalecki analysis with a Marxist analysis with Bridging the gap: between Kalecki’s words and the modelling of monetary macroeconomy (http://www.jourdan.ens.fr/levy/dle2012g.pdf) and Keynesian and Marxian macroeconomics: towards a synthesis (http://www.jourdan.ens.fr/levy/dle2011g.pdf). After much detailed and often incomprehensible analysis, they conclude “Despite such promising inroads, however, the models presented by Kalecki do not actually lay the foundations of what could be seen as a “common ground” within heterodox economics”. Oh dear! Once again, don’t get me wrong. This does not mean austerity is the right policy. The recent suggestion by the IMF director general Christine Lagarde (salary $470k per year and no tax) that austerity has worked by citing the likes of Latvia and Estonia is so much bunkum, as the Keynesians have shown. 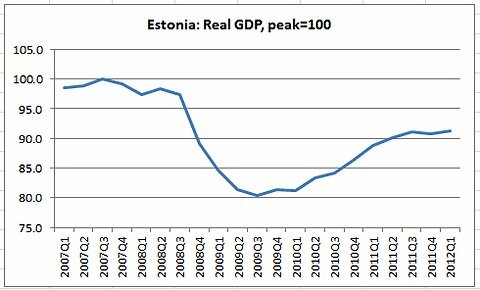 The graph below shows that government spending cuts etc have not returned Estonia’s GDP back to pre-crisis levels. Greece has carried out a larger fiscal consolidation than plucky little Latvia and is still in deep depression. These very small capitalist states in Eastern Europe have done a little better because they received huge fiscal transfers, way more than Greece (see the comments of the IMF’s chief economist and semi-Keynesian, Olivier Planchard, http://blog-imfdirect.imf.org/2012/06/11/lessons-from-latvia/). Around 20% of Estonia’s budget is made of EU funding. No banks were bailed out because they are owned by Sweden and other Nordic banks and their exports are heavily oriented towards Scandinavia, which has generally fared much better in the long depression. And government debt was never high in the first place. What really helped these economies turn around, such as they have done, was not fiscal austerity, but the destruction of labour rights to allow employers to boost profits and emigration. A sizeable proportion of the Baltic people have left their homelands to find work in the rest of Europe. Skilled workers have disappeared. Latvia has undergone a demographic collapse. Young Latvians have fled the country. In 1991 the population was 2.7 million. The most recent census shows the population had dropped to 2 million, but is probably lower because of continuing emigration. The ‘solution’ of emigration is not new – the Irish did this for centuries and in this current crisis, emigration is again part of Ireland’s ‘solution’, not fiscal austerity and obeying the dictates of the Troika as the Euro leaders and the IMF like to suggest. But that also does not mean that more government spending a la Keynes is going to boost investment and take us out of the long depression either. The trouble with Keynes is that he is so inconsistent in his ideas that it becomes even more difficult to follow just what his theory and views are than it does with Marx! Keynesian followers argue about what he really said even more than Marxists do about Marx. Some followers reckon he was a radical opposed to capitalism (see Geoff Tily’s book, Keynes Betrayed), Others consider that he was actually conservative. Krugman, like Keynes, swings from one view of Keynes to another. Keynes was a dynamic personality and a great writer on current events (as was Marx) but his General Theory of Employment, Interest and Money makes Marx’s Capital seem like a model of simplicity. I know that Keynes answered his arch rival, the Austrian economist Hayek, who complained that he kept changing his views (see the excellent book by Nicholas Wapshott, Keynes/Hayek), by saying that ‘if the facts change, I change my ideas, don’t you?’ But it does not help if somebody changes ideas like changing shirts. By that, I mean sometimes Keynes seems to saying that the answer to depression is easy money and low interest rates; at other times, he argues that is not enough and you need government spending and budget deficits; and then later he argues that budget deficits are bad. Sometimes he advocates the ‘socialisation of investment’ implying replacing capitalist investment, but at other times, he wants private capital protected. He goes on: I must not be misunderstood (lets try not to! – MR). I do not suppose that the (neo) classical medicine will work by itself or that we can depend on it. We need quicker and less painful aids. . . . But in the long run, these expedients will work better and we shall need them less, if the classical medicine is also at work. And if we reject the medicine from our systems altogether, we may just drift on from expedient to expedient and never get really fit again.” (Ibid. : 186. Thus Keynes seems to be arguing that his view of depression and his solutions of easy money and government spending should be seen as just temporary, because the capitalist mode of production is fine and will tend to a beneficial equilibrium as neoclassical economics argues. Apparently, “in the long run”, we are not dead, after all. The usual response of people who are accused of not really knowing where they stand is to say that consistency is the province of clerks. Well sometimes, clerks have a point. Take his views on profit. In the General Theory, you find him raising the idea of profitability pretty early. He calls profitability ‘the marginal efficiency of capital’, using neoclassical terminology from the concept of ‘factors of production’. So profit is the return on the factor of capital, just as wages are the return on the factor of labour. Keynes interestingly tells us that cycles of boom and slump are ‘occasioned’ by changes in the marginal efficiency of capital. Indeed “the predominant explanation of crisis is not primarily a rise in the rate of interest, but a sudden collapse in the marginal efficiency of capital”. This sounds promising, but don’t get your hopes up! What causes a crisis is when entrepreneurs are over-optimistic about potential profit relative to the going rate of interest. So the problem is not the rate of profit as such, but unpredictable expectations that it will be high enough to justify the going rate of interest. When it is not, then a crisis can ensue. The crisis is a product of wrong judgements, not the actual rate of profit relative to the needed reproduction of capital, as Marx would argue. The marginal efficiency of capital properly expresses the return on that factor of production as it tends to an equilibrium. So there is nothing wrong with the production process under capitalism. The problem is in the financial sector where the rate of interest gets out of line. So very quickly Keynes drops his analysis of profit and moves on to more short-term fluctuations in the financial sector – the monetary sector to him (for Marx, the whole economy is monetary). And here the subjective triumphs over the objective and profits as an objective economic category soon disappears from view, so that modern followers of Keynes concentrate almost entirely on his macro identities for an explanation of the laws of motion of capitalism, as we have seen. So what is the correct policy response to the long depression? A Marxist analysis, in my opinion, recognises that the underlying cause of the crisis in the first place is to be found in the failure of capitalist production to generate enough profit. Then, until capitalism can destroy enough old or ‘dead’ capital (employees, old technology and unprofitable weaker capitalist enterprises) to restore profitability and start the whole thing again, it will languish. In this long depression, I reckon this will require another big slump. Keynesian-style government spending programmes can alleviate some of the pain for labour and government investment can help create new jobs. But this will not boost profitability, but instead will be at its expense. And as long as capitalism is the dominant form of social production, that will mean government spending will delay the capitalist recovery, not speed it up. The slump of 1937-8 was not the result of the withdrawal of government spending, but because those programmes were not working in restoring profitability. If we want to end the long depression and avoid another big slump, bigger than that of 1937-8, we need to end the capitalist mode of production and replace it with democratically controlled, planned social production. PS Guys, I suddenly thought that I ought to justify my closing remark that US profitability was not restored to the level of 1929 by 1937 and another slump was necessary to try and do so. I checked my data on the US rate of profit and indexed the level at 1929 to 100. This is what I found. 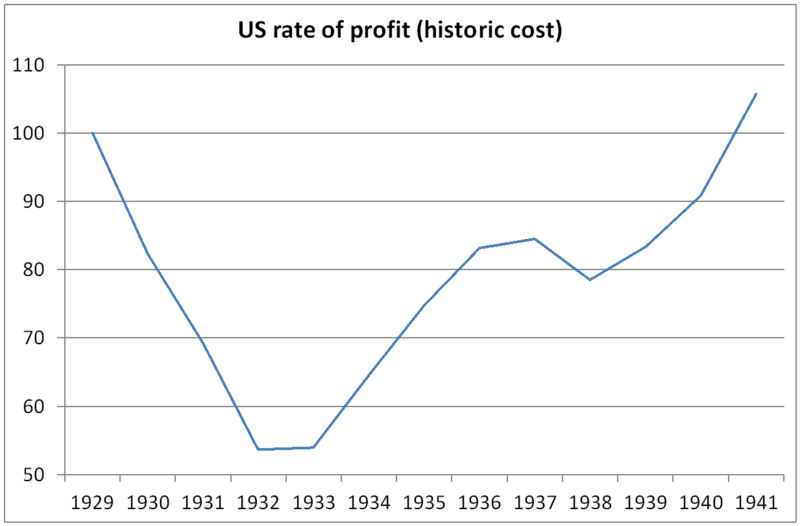 As you can see, the US rate of profit was still 20% below its 1929 rate in 1937. Indeed, it did not return to its pre-depression level until the war began. This entry was posted on June 13, 2012 at 3:07 pm and is filed under capitalism, economics, marxism, Profitability. You can follow any responses to this entry through the RSS 2.0 feed. You can leave a response, or trackback from your own site. Thank you. Very informative. This is a place to get the “facts” about Latvia, Great Depression, Keynes…. I find it incredible that many Marxists are simply Keynesians when it comes to political economy. I think one reason is the general lack of Marxist analysis of the current economic situation so by default the mainstream media becomes the source of analysis. Hopefully more will discover this blog as a source of analysis and information. It’s embarrassing, disappointing, and frustrating when I hear Marxists regurgitate Krugman and other Keynesians. When viceroys of capital like Lagarde defend austerity, aren’t they using the truth as subterfuge? I mean, in one sense it is working; austerity is hollowing out constant capital so that profitability can be rebooted. So her statement is true , from capital’s point of view. The trick is to imply that everyone – including the sacrificial lambs (us) – involved in the renewal ceremony are benefiting. I think it frustrates Keynesians, because like Keynes, they desperately need to believe that social contradictions have already been resolved by the state and hence they hop back and forth mindlessly between contradictory points of view. In other words, their deep presupposition is that capitalism is a machine – an ultimately rational thing – and that all apparent primitive irrationality that it spawns is a product of a corrupting atavism smuggled in by the less than adequate human users. Hence their remedy is and always will be “correct the users,” through enlightened guidance, education, training, whatever. They will never recognize that the irrationality is intrinsic to the mode of production itself, and burns brightest precisely when the agents are acting most rationally. Cameron sums up my problem with ‘pure’ Marxists. If you say you don’t object to some Keynesian solutions that must mean you are a Keynesian. In the current period Keynesian solutions are better than those offered by the Austerity economists, at least for the working class. Yes we would like to say the solution is overthrow capitalism and replace it with a co-operative socialist society but really, that won’t happen overnight. And while we have capitalism some of the solutions must accept this reality, as must some of the rhetoric. As for the final graph, a fairly straigt line trend seems to be apparent, so I am not sure your argument entirely stacks up. paying higher fees and taxes to pay for the money borrowed. Taxmageddon is on its way. It’s also paying higher prices as a result of higher inflation due to money printing. The rich/capitalist is getting richer and the poor/worker is getting poorer. Real unemployment is creeping higher. Wages have been cut. Taxes and fees are higher, prices of commodities are higher, exploitation is more intense…. If you think that the spending/printing/borrowing frenzy is sustainable think again. I urge you to read Michael’s article again this time from a Marxist point of view not a Keyensian point of view. Challenge Michael’s arguments and conclusions. Isn’t it time to abandon reformism? Is socialism that scary? The frightening thing is that the destruction of value necessary to return the system to profit has barely begun. The safety valve of migration traditionally open to the peripheral states is largely closed off; the core states have much fewer options without theirs colonies and dependencies to shift costs on to other populations. Capital has little alternative but to dismantle the welfare state and press down on the working class. Very hard to see a happy way out for the ruIng elites which will not provoke a strong counter action threatening their interests. QE as I understand it has the effect of maintaining asset values across a range of classes by making bonds unattractive. That does not seem like devaluation. Letting banks go bust would have been the honest and principled thing to do from a capitalist viewpoint and might have got the pain over sharply and quickly: indeed is that not what monetarists claim of the New Deal that it prolonged the the Depression? Perhaps I should have said Keynes’s followers want us to focus on the Keynesian macro identities rather than Keynes himself, although Keynes certainly wanted us to look at the macro economy. Michael, of course Keynes wanted us to look at the macro economy. After all he was (according to most histories of economics) the economist that actually originated macroeconomics. That he has had a lot of “followers” like Hicks, Samuelson, Mankiw et consortes that have totally misrepresented his theories is nothing we should blame on Keynes himself. I agree that Keynes’ epigones have misrepresented his ideas, as have followers of Marx, causing Marx to say on more than one occasion that he was not a Marxist. As I said in the piece, followers of Keynes argue about what his views or theories really were even more than followers of Marx do with Marx. But I’m not sure Keynes would claim that he originated macroeconomics – the Physiocrats, Adam Smith and other classical economists were there first, surely. 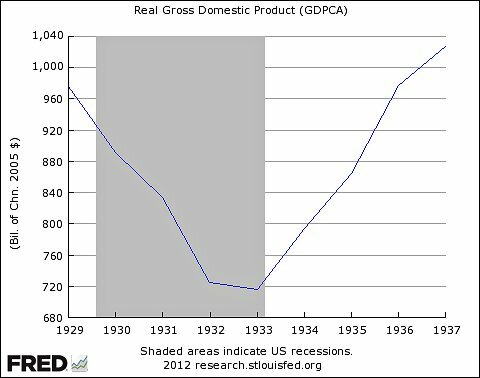 Your graph shows that profit returns in ’32 when FDR puts more surplus value back into the pockets of the working class via government programs and the establishment of Social Security and unemployment insurance as time went by. The class struggle is over the control, ownership and use of the surplus value the workers produce. The workers are the market. The workers need more wealth via raises in their real wages and social wage in order to stimulate ‘the economy’ through sales. Sales boost ‘confidence’. Same could happen now, if the capitalists were politically forced to share more of the wealth with its producers. All WWII did for ‘the economy’ was force the capitalists to funnel more surplus value back to the workers. IOW, I think the whole ‘creative destruction’ line is counter productive, fatalist even. The point of the class struggle from labour’s pov, is to gain more control over wages, the length of the working day and working conditions. The irony is that up to a point, more surplus value going back into the workers’ control also expands the market for commodity sale and sales are what commodities are produced for. These policies aren't supposed to give a positive return to the Treasury! I don't think anyone ever said so, since it's not the Treasury's goal to make a profit. If the US government makes a profit on any operation, in fact, Congress mobilizes to privatize the profit opportunities. The "profit" is supposed to be in terms of non-paid-for benefits to the "public." For example, in addition to directly helping Pres. Obama's financial supporters, alternative energy projects are (in theory) supposed to reduce carbon emissions, slow global warming, and ultimately help long-term real GDP growth. The main beneficiary of the last is the "private" sector. I agree. I was just posing how vulgar apologists of capital like John Cochrane pose the question: namely that state-induced investments are an infringement on profit in the capitalist sector. In that sense, unless the state goes onto dominate investment and growth through a plan, it could delay a recovery by lowering the profitability of capital. Renowned Professor Michael A Lebowitz sent me this comment personally and has kindly allowed me to add to the comments section on this post: “Is this dichotomy so marked if we recognise that exploitation is the source of (latent) surplus value but that capitalist expenditures are important in determining the realisation of surplus value?” Below is my reply. I think I would answer your point in this way. Clearly, value must be realised in the market. The market for goods and services is either from workers or capitalists. Capitalist expenditures are just as important as workers consumption, otherwise capitalism would be impossible, not just subject to ‘underconsumption’, as the crude version of that theory goes. The issue with the Keynesians is which comes first, profit or realisation?, both in theory and in reality. I think Marx says it starts with exploitation and generation of value in the capitalist mode of production. Thus for Marx it goes: from profit to investment to consumption, but NOT from consumption to investment to profit (or income), as Keynesians would have it. Investment and consumption still have to take place (thus realising value through the market), but ‘effective consumption’ is NOT the aim of the capitalist mode of production as Keynesians think. Instead it is ‘money to make money’ first through exploitation and the through realisation on the market. Uncertainty and instability in realising value in the market are inherent for individual capitalists. But what leads to a general failure to realise value is Marx’s law of profitability. The crisis starts when the weaker, less productive capitalists cannot realise their production in the market except at a loss and so eventually go bust. The power of socially necessary labour time is thus exerted through the average rate of profit to market realisation. If this is the right way of looking at it, it means that trying to boost ‘realisation’ with ‘purchasing power’ will not allow capitalism to exit any crisis, although it may help labour. Exiting the crisis under capitalism depends on raising the rate of profit. You raise some very important points. As you can see from my post, G Carchedi has been developing a Marxist multiplier to counterpose to the Keynesian one, arguing that even in the consumption goods sector any stimulus will not work or at best postpone a crisis. Carchedi and I are working on a joint paper which we hope to publish soon. Mandel mentions the following with respect to the world recession: (1) conjunctural demand factor — namely, contraction of world trade due to recession in the imperialist countries (core of world-system); (2) conjunctural management — namely, “neo-Keynesian recovery techniques” (“enormous injection of purchasing power”) in the core countries, which lead to a short-term surge in demand for consumer goods, which “effectively halted the recession”; After decades of lowering the wage rate in GDP in many countries (see O. Onaran) there are strong underconsumption tendencies…. Doesn’t this support the ‘liquidationist’ Austrian-type school of thought, i.e. that the government should do nothing (or better still enact austerity policies), allow mass liquidation and bankruptcies and unemployment to occur, and then the economy will come roaring back? The Austrians reckon the economy will come roaring back as long as government and central banks stop interfering with the market economy, which on its own will tend to achieve harmonious ‘equilibrium’ growth. For them, the problem is excessive credit, injected ‘exogenously’ by central banks or government borrowing. Excessive credit leads to ‘malinvestment’ and then eventually to collapse in the banking sector. This excessive credit must be liquidated as well as the ‘malinvestment’ (jobs and indebted companies). The Marxist view is that it is not excessive credit fundamentally that causes crises but lack of profit relative to capital advanced. Injecting more credit can only delay the crisis and make it worse. But once the slump is underway, cutting spending or withdrawing credit (liquidation) will only make things worse by reducing demand even more. On the other hand, increasing govt spending or credit won’t get the capitalist economy out of the slump if profitability is not restored. It is the case that ‘austerity’ measures that cut labour costs to raise profitability can turn things around eventually but, as I say, this could make the slump even worse for a while. And the turnaround could take years. The Great Recession of 2008-9 has been followed by six years of depression and no ‘roaring back’. Profitability has not recovered enough (except maybe for the US). European governments have applied more austerity than the US and so the depression has been worse there, but the correlation between growth and profitability is much greater than between growth and austerity. I don’t see how the author can argue that the profit equation can’t incorporate the idea of surplus profits. It simply states that in a capitalist system where workers wages are less than the total revenue derived from the sale of consumption goods, the remainder simplified constitutes the profits of capitalists. Minsky who uses Kalecki even goes to argue taxes work in a similar way to ensure wages add up to less than total output of consumption goods. In fact it is arguable for a business to stay in business it needs to earn a profit.